This Nov. 14, 2011 photo shows beef rib roast with shallot-merlot gravy and vegetables in Concord, N.H. This recipe uses a bone-in rib-eye, a beautifully marbled, flavorful cut of beef. A rib roast is a classy addition to your holiday table. Served alongside roasted potatoes and vegetables, it is hearty, homey and elegant. For this recipe we used a bone-in rib-eye, a beautifully marbled, flavorful cut of beef. And since the meat itself is so delicious, we kept the seasonings classic and basic, serving a merlot gravy alongside the roast. If you can't find a rib roast with the bone, use a rib-eye roast (the same cut but without the bone). Keep in mind that the roasting time will be slightly shorter. Before starting the recipe, let the rib roast come to room temperature for 1 hour. To prepare the roast, in a large roasting pan, arrange the onions, carrots, celery, garlic, thyme and rosemary in an even layer. Season the rib roast all over with salt and black pepper. Place the roast on top of the vegetables in the roasting pan. Roast for 15 minutes, then reduce the heat to 325 F. Roast for 2 to 2 1/2 hours, or until the roast reads 130 F at the center for medium or 120 F for medium-rare. Transfer the roast to a serving platter and cover with foil and several layers of kitchen towels. Reserve the roasting pan without cleaning or emptying it. While the roast cooks, prepare the roasted vegetables. In a large bowl, toss the carrots, parsnips, beets and potatoes with the oil, salt, pepper and rosemary. Spread evenly on 2 large rimmed baking sheets. When the roast comes out of the oven, raise the temperature to 400 F. Roast the vegetables, stirring occasionally, for 30 minutes, or until they are tender and browned. To make the gravy, after removing the roast from the pan, place the roasting pan on the stovetop over medium-high heat. Add the wine and scrape up any browned bits from the bottom of the pan. Using a slotted spoon, remove and discard any solids from the pan. Add the shallots, thyme, and 2 cups of the beef broth. Bring to a simmer and cook for 3 minutes. In a small bowl, whisk together the remaining 1 cup beef broth and the flour. While stirring continuously, add this mixture to the roasting pan. Continue to cook while stirring for 3 minutes. Season with salt and pepper. 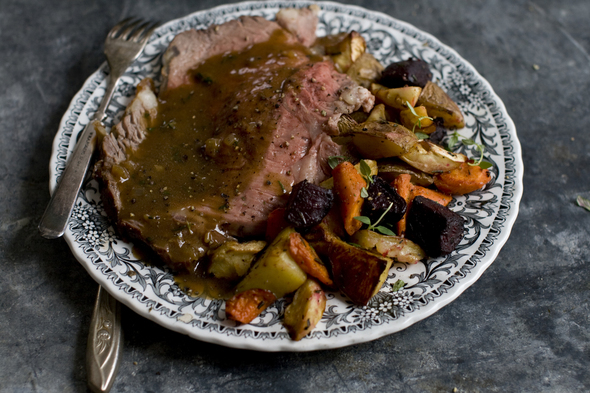 Serve the roasted vegetables and gravy alongside the roast. Nutrition information per serving (values are rounded to the nearest whole number): 720 calories; 450 calories from fat (63 percent of total calories); 50 g fat (20 g saturated; 0 g trans fats); 150 mg cholesterol; 22 g carbohydrate; 41 g protein; 5 g fiber; 580 mg sodium. Sat, Dec 17, 2011 : 4:50 p.m. Thank you for this recipe I am going to try on Xmas day!